Finally, a chassis fit for an enthusiast! 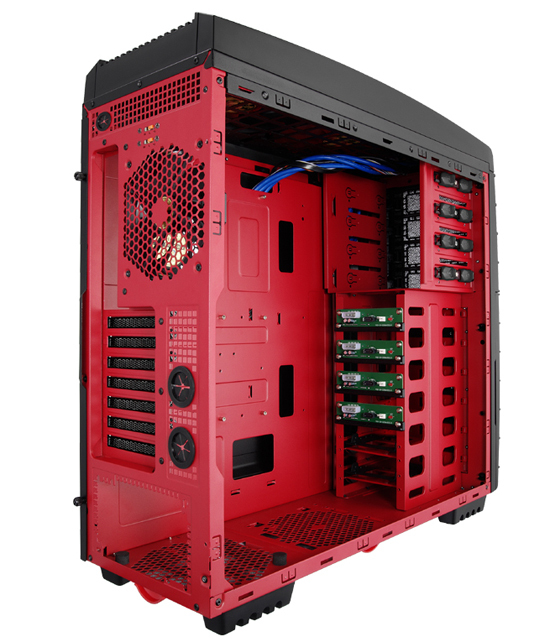 Hurrican 2000R features eight fans, four easy swap bays for hard drives, and a list of features designed with your needs in mind. Arrayed with 8 stock fans, each strategically placed to cool your state-of-the-art components that are generating more and more heat nowadays. Hurrican 2000R¡¯s innovation includes two gigantic fans on the left panel that provide separate cooling for your CPU and graphic card, and one 120 mm fan on the right panel to cool your motherboard. Until today, the maximum number of fans a chassis comes with is five, AZZA Solano 1000/1000R is amongst this elite group. Before the introduction of Hurrican 2000 or 2000R, eight stock fans have simply been unheard of! If you want even more cooling, the chassis supports up to 360 mm water cooling radiator. Featuring 4 easy swap HDD bays, Hurrican 2000R provides effortless access to your installed components. It has additional two trays for SSD and 2.5¡± HDD. The case can accommodate full ATX and Extended ATX motherboards, with extensive storage capacity and stacks of drive bays to install all your gaming needs. It supports up to 340mm (ATI 5970), the longest graphic card in the market, and even comes with a USB 3.0 connector. The list of features just goes on and on. That¡¯s not it! Your aesthetic needs and attention to detail are being met by the scintillating red interior that nicely complements its audacious black exterior in Hurrican 2000R. With unprecedented cooling provided by eight fans, easy accessibility supported by four easy swap bays, a spacious design and a future-proof layout, you ask for a better chassis you don¡¯t have to sacrifice quality to save money, AZZA gives you Hurrican 2000R.